VisionTech Angels enjoys a very diverse membership with one thing in common: a passion of investing and supporting promising start-up companies. While many of our members come to angel investing from business, Keith Davis, a member of our VisionTech Angels Bloomington chapter, has taken a different journey. 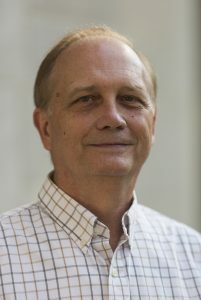 Keith joined Indiana University in 2014 as the director of the Johnson Center for Innovation and Translational Research at Indiana University (IU) Bloomington. He’s also a senior research scientist in IU’s Biotechnology Program focused on developing cancer chemoprevention agents and therapeutics. Prior to joining IU, Keith was the director of the Owensboro Cancer Research Program in the James Graham Brown Cancer Center at the University of Louisville. Keith is also a seasoned entrepreneur. From 1999 through 2006, he was affiliated with Icoria, Inc., and its predecessor, Paradigm Genetics, holding positions that included director of plant research, vice president of agricultural biotechnology and executive consultant. In 2005, Icoria sold its agricultural division to Monsanto for $6.75 million and its remaining operations to Clinical Data for about $12.75 million. Today, Keith is CEO of a start-up company, Planta BioProducts, which is developing nutraceutical products based on his research. VTA: What got you interested in angel investing? KD: I had several reasons. First, the unpredictability of the stock market and the fact I have significant assets already invested there. I have some exposure to real estate, but don’t find that a particularly interesting or exciting investment. I wanted to have a portion of my portfolio in high risk/high return investments that I could pick with the maximum amount of transparency possible. Another important factor is that my current position at IU as director of the Johnson Center for Innovation and Translational Research is focused on helping faculty commercialize their research innovations. As such, I advise faculty on whether their concept/technology is sufficient to start a company, and what options are available to pursue this. Thus, I felt it was critical to get integrated into the local investor community and found no better way than to work with VisionTech Angels. VTA: What do you like most about angel investing with VisionTech Angels? KD: Although I’ve only been a member since May 2016, it’s clear that the group is well organized and has a number of experienced investors with diverse backgrounds and knowledge. I particularly like the team approach to doing diligence on potential investments. VTA: What have learned from angel investing that you may not have otherwise? KD: I’m learning new ways of presenting a company’s materials to potential investors, as well as the mechanics of systematically evaluating a start-up company in areas outside my expertise, biotech. VTA: How does your current profession help inform your angel investing? KD: Since one of my job functions is to help faculty start companies, I get to interact with entrepreneurs routinely and see companies at their very early stages. I also work with larger companies that are interested in working with faculty and their companies to co-develop technologies. It also allows me to continue to grow my expertise in evaluating intellectual property and managing IP portfolios. VTA: How many investments have you made with VisionTech Angels? KD: One so far: SonarMed, a sophisticated airway management system for health care. VTA: What is the biggest value add of being a VisionTech Angels member? KD: As a member of VisionTech Angels, you get an organized way to make angel investments with a knowledgeable support group, which is much, much better than trying to do one offs on my own. Another major value add is that you have a chance to see many more opportunities than you would as an individual investor or as a member of a smaller group.